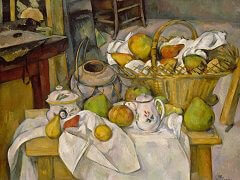 Objects - pots, fruit, basket, cloths - are assembled on a table in a simply furnished kitchen. The artist nods to the historical tradition of still-life in previous centuries, from Italy and Spain, to the Netherlands and France. 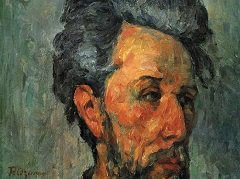 But really, as always, Cézanne's subject is painting itself. How can you render the real world using liquid pigments on a stretched flat canvas? 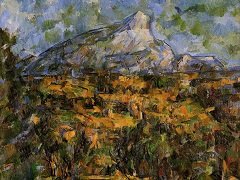 Cézanne investigated forms, reducing them to simpler geometries, and reassembling them in complex combinations to represent painted truth. 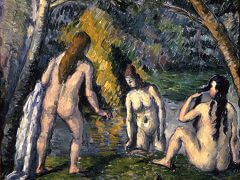 Paul Cezanne pushes the table and cloth close to the viewer, cropping them at the bottom. Individual pots sit uneasily on an impossibly tilted plane of table-top. The grey ginger-pot has no surface left to sit on, and neither has the large basket at the back. But they demand their space, painted from above, or front-on, as the composition requires. Similarly, the table, cupboard and chair line up diagonally on the left, none holding any probable perspective. A wooden member intrudes on the right, casting an unbelievable shadow, and belonging to what whole? It could be an errant stool, or ladder leg, perhaps. 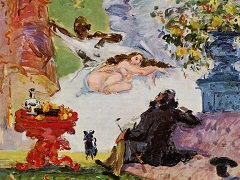 But compositionally, it continues the frame around the objects which begins in the lower-left corner with the table edge, and is then taken up by the line where the back wall meets the floor. The internal frames compress the composition even further, and force an overall lozenge shape. And yet, each distorted element has its convincing volume, with a glorious harmony of red, green and yellow fruit. Warm hues of wood and cane contrast with the cooler white, grey and purple of cloth and ceramics. The loop of the ginger-pot is repeated larger in the basket handle, smaller and vertically in the handle of the coffee-pot, accentuating the rounded shapes of the fruit. 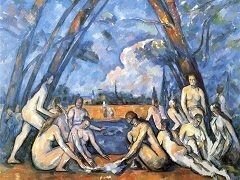 All these circular forms cascade diagonally down the canvas, through the folds of the two white cloths which double and then unify the composition. 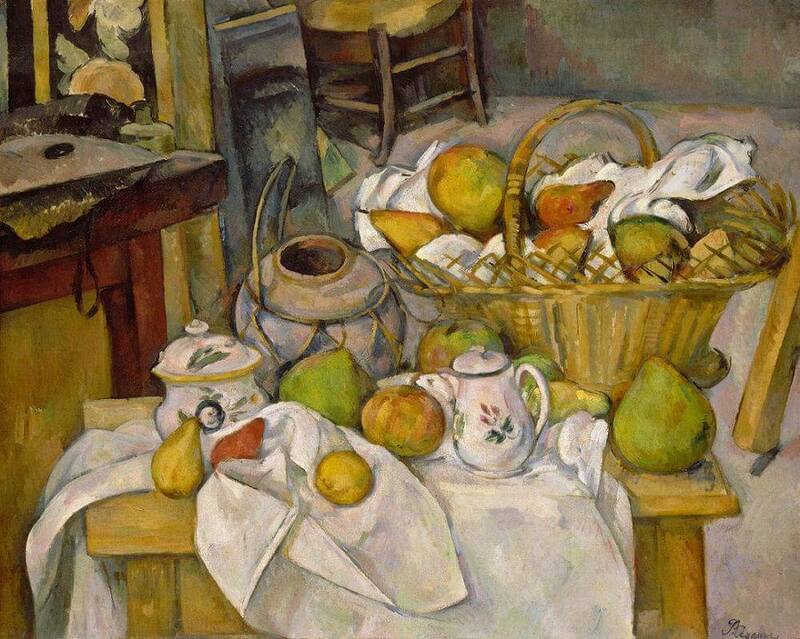 Kitchen table is a very rich and variously populated still-life in Cézanne's oeuvre (see Still Life with Apples and Oranges) with details such as the floral decoration on the china coffee jug repeated on the round pot, then writ large in the flower painting on the wall. 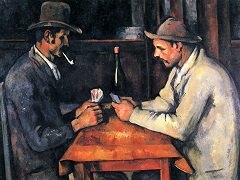 In his lifetime, Cézanne was ridiculed for lack of conventional artistic skill, and excoriated for his aesthetic eccentricity. In other words, he did not paint like other people. But he stated 'I shall astonish Paris with an apple.' Here he astonishes us with apples, pears and melons which jostle for their own space, and demand our attention like no static still-life or nature morte ('dead nature', as the French call it) ever could. 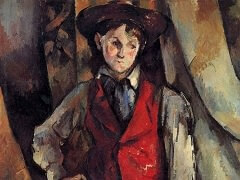 Like most truly modern artists, Cézanne was wrestling with doubts, rather than representing certainties.